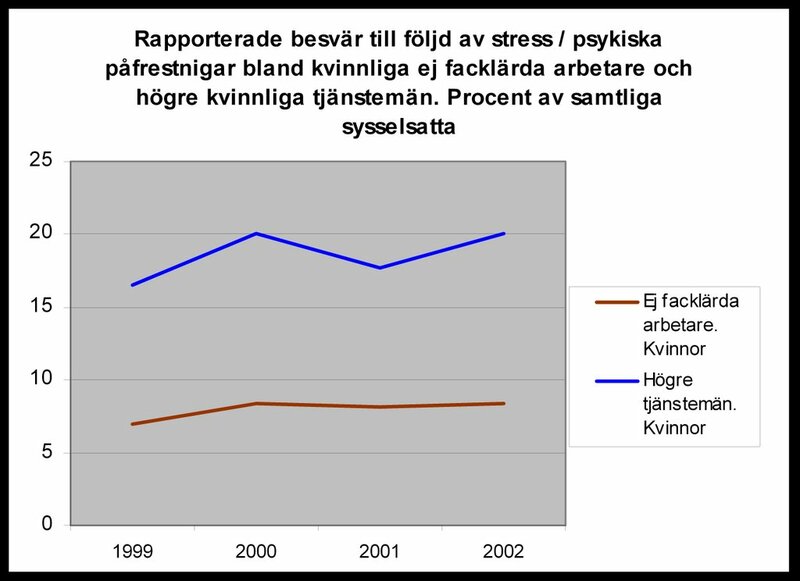 Professors blogg: Is it really ''stress'' what causes the main problem among Swedish students? The fact is that women and men (particularly women) with higher education and social status are significantly more prone to declare that it is stress and psychogenic reasons those behind their problem in their working places. It is true that sectors among the Swedish students do experience stressful situations in association with their economy, quality and expectancy of their studies and career. The situation is however not representative of Swedish students as a whole. 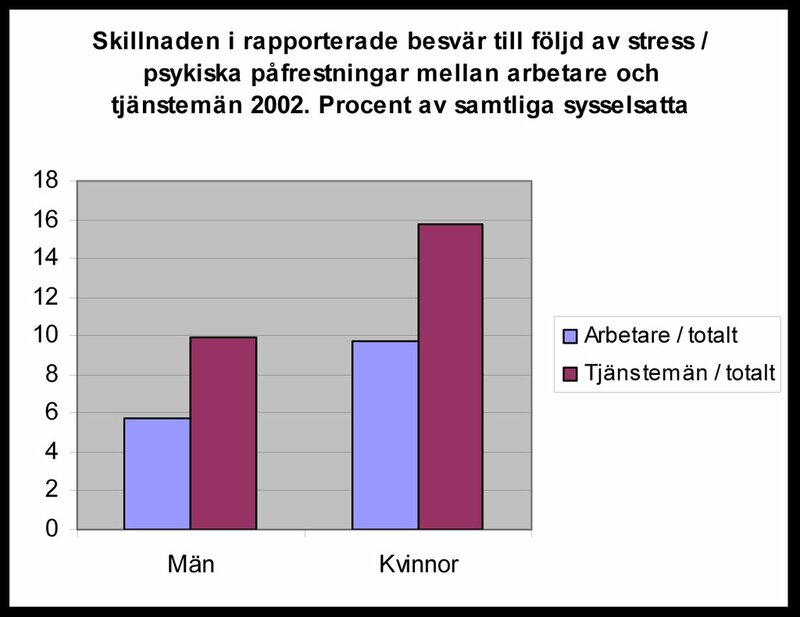 Rather than "stress", the contributing causes for such discomfort are rooted, apart the economic factor, in concrete practical problems associated with learning, alienation of contents and goals in the Swedish higher education, and existential problems of the kind affecting the Swedish population as a whole. At the contrary of what the politically correct assumption indicates, it is highly dangerous for the students - and the society as a whole - to wrongly identify at "mental or affective levels" the source of the problems experienced. The risk in "psychologizing" a problem which is in the root political and in its solution resort of the student movement it self (even if nowadays practically none existing in Sweden), can lead to further "poor health" by simply affirming the status quo of the causes, and by not discussing upon the real issues and contribute to their solution. Instead of playing a victimized role of passive societal actors, students should go out and fight for their right - and duty - to transform the society they criticize. They would very well start by transforming the anachronistic and antidemocratic structures at their universities, and which are partly accounted for the problem they say to suffer of. Further, based in epidemiologic methodological aspects, is safe to say that the publicized figures of university students declaring to experience stress would be much lesser than the reported. Declaring the experience of stress by answering questionnaires presenting options in form of fixed statements, is not a scientific evidence of the clinical existence of a disease-related negative stress. The actual socio-economic background of the Swedish students as a whole - particularly in an international context or comparison - highly discusses the general statement of a strict correlation between poor Swedish students and stress and poor health. The number of sick-leaves (sjukskrivningar) that can be administratively shown among the students, even if increasing, is a very, very poor proof of the existence of a high level of poor health among the students. In Sweden, the majority of sick-leaves are not decided by doctors on the base of clinical symptoms, but on the base of "patients" wishes for such a sick-leave. University students do not experience significantly more stress than the general population. University students do report more levels of stress and psychological items than the general population. University students are in this regard equalized with the social group in its majority they belong, both by education level and socioeconomic status. 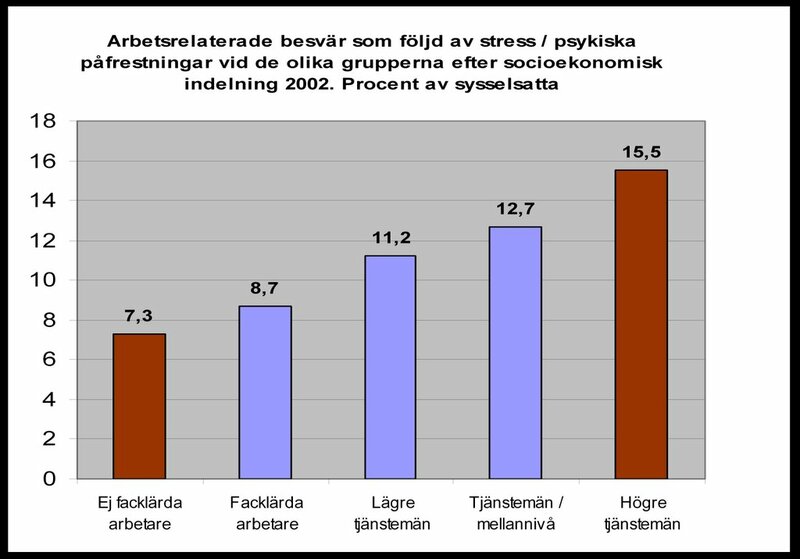 The facts are instead - as seen in the graphic bellow - that in Sweden there is a correlation between educational level and levels of reported stress and psychological strain. The newspaper Expressen ran recently an article referring to a supposed growing stress among Swedish university students. This stress, according the paper, would be that aggravating or detrimental, that it is actually “decimating” the students. 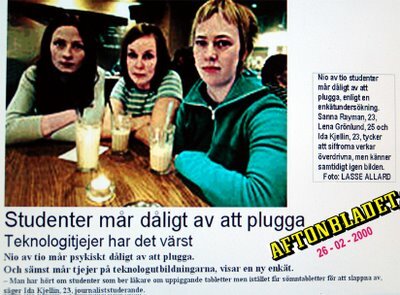 Much of the article refers to the Student Union own study “Stoppa pressarna”, an investigation conducted on the mental devised to characterize the health status among the Swedish students. The study have concluded that mental health problems deteriorates increasingly, being reason for a serious concern. I have examined this study and found that in its turn it is much based in another investigation, the TRIA-Rapport, conducted by the company REWIND, under assignment of the employees and students unions HTF, SKTF and ST.
As typical in this sort of assignments, the main question in the Tria report was not to find out whether the student experiences stress or not, but “up to which level they experience stress” (“I vilken utsträckning känner du dig stressad?”). No wonder that their results were “that stress is a very common problem among the students”, and 52% agree with the formulation (Rewind’s formulation) that to a great or very much extent they feel them selves stressed”. Also predictably, the vast majority (61 %) of the respondents were women. Please do note in this context that the main issue in the debate in which this population study is used, is the "increasing poor health, particularly mental health, among the Swedish university students". So, publicly manifesting the "problem" of high levels of stress is a means of implying the students' poor health. But what is not tell explicitly is what is really what we are measuring in those studies when we refer to stress, and how established and reliable the findings can be from a clinical or an epidemiological standpoint. First, trying to identify pathological or negative stress, we have that the questions in these sort of studies (now I refer to one study SFS in its turn praise in their cited document) are such confounding and unprofessional. For instance, they embed the item "stress", together with "worries" (oro) and feelings of "sort of anxiety" (which is not the same than proper anxiety). Meaning the one who in a given moment has felt "oro" (and who does not that naturally from time to time) is categorized as having stress. And not only "stress". The interpretation goes for it is a "negative" stress, unhealthy stress, etc. All which in its turn would explain the need for, or the current existence of, a widespread sick leaves among the students. So, to have "the feeling", or having the "idea" of being ill due to stress, can be sufficient according the Swedish general interpretation, for granting a sick leave to the stressed students? As a professor in public health sciences, especially Epidemiology, I have to frankly state that the results of the Tria investigation doubtfully meet the scientific standard for reliable conclusions on the main aspects investigated. Why? Apart of the above, the main flaw being the remarkable low response rate (33%) they achieved in their investigation, all which means the investigation had a dropout of 67 per cent! In effect, they have asked 4 500 students and they got only responses from 1 303. 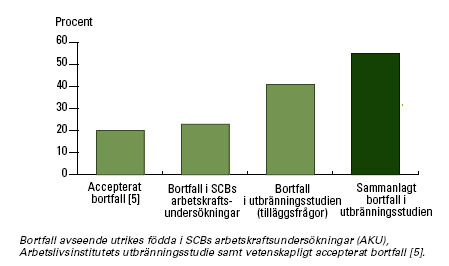 As it can viewed in the diagram on the box (from an article I published in the Journal of the Swedish Medical Association, Läkartidningen), the accepted dropout for such studies (to be eligible for review or publication) in scientific journals is only five per cent (see the all article here). I will develop later a comment on the Tria-rapport in reference to socio-economic indicators characterizing the university students' situation. ”Studenters stress” som utförts av företaget Rewind, på uppdrag av det fackliga samarbetet Tria.7 Undersökningen har besvarats av 1503 studenter. Undersökningen visar att stress är ett vanligt problem bland studenter. 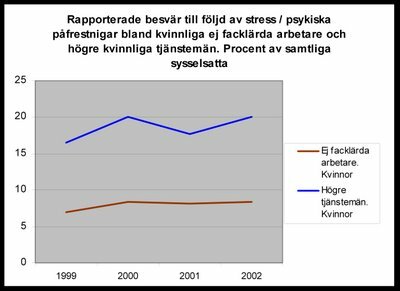 Mer än hälften, 53 procent, instämmer i stor eller mycket stor utsträckning med att de känner sig stressade. I undersökningen har man dessutom försökt identifiera en grupp med särskilt stora, stressrelaterade problem." The report Stoppa pressarna - 17 punkter för att minska den psykiska ohälsan bland studenter is signed by Maria Noleryd and Pär Wiktorsson. Why is this ecuation responses-rate versus dropout-rate so determinant? In searching for answers "about stress among university students", those who are certainly more engaged and eager to participate in such studies are those who either experience that "stress" or have been told that the problem they confront in their existence as students is "stress" and "burn-out" (utbrändhet) and not other problems. In this fashion, the results of the population study will NOT reflect - with minimal acceptable level of certainty- the situation of the Swedish university students as a whole, but of those who felt them selves "called" for participating in the study. And this is why the scientific journal Evidence-Based Medicine (1995) has pointed out a minimum of 80 per cent responses-rate, and 80 per cent in follow-up rates in post-tests, for a study can qualify for reviewing and eventually publication in such scientific journal. (see Bowling A., Research methods in health.Philadelphia: Open University Press; 1999:163.). This is the methological principle that, to the best of my knowledge, is applied by every serious scientist (a few of them is not) at the Karolinska Institutet. Nevertheless, talking about students' stress, one first question is to asses whether the 310 000 students organized by SFS are much different from the rest of the Swedish population, in terms of their vulnerability for “stress” and “burn-out”. In this respect we have the fact that students, due to their both social and intellectual position, are as equipped, as any well educated people, to better understand psychological concepts such us stress and burn-out, and to express verbally accordingly those notions. The fact is that women and men (particularly women) with higher education and social status are significantly more prone to declare that it is stress and psychogenic reasons those behing their problem in their working places. The above is the result of an investigation we conducted at the Karolinska Institute (Ferrada-Noli, Svanström) and which has been reported in an international conference in Hongkong. The diagrams are part of our presentation and should not be reproduced without permission. See abstract here: :(http://www.hig.se/~mnf/pages/Ferrada-Noli%20ABSTRACT%20NR%201.doc). A second question is to clarify whether all student-branches (careers, programmes, etc) share such common situation as to refer to the Swedish university students as a whole. In this respect appears that only certain programmes, such the Law-studies programme, poses higher levels of psychological demands on the students. This is not related to the studies their selves, but to the hard requirements of highest marks in order to qualify for further positions in the juridical system of Sweden. A third relevant question is whether this is a new situation among the students, as it is implied. Or even, as clearly manifested, if it is a situation that worsens more and more. 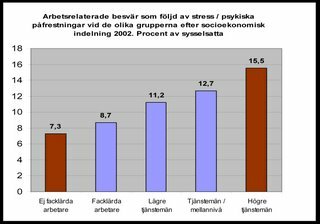 "De vanligaste psykiska besvären är stress, ångest och sömnsvårigheter. . ."
According to the Aftonbladet article six years ago, 86 per cent among the students asked by the newspaper Campus declared that their studies had a negative impact in their health. Now, in 2006, the studies mentioned introductorily talks of 53 per cent of stress (Rewing study) among the students. 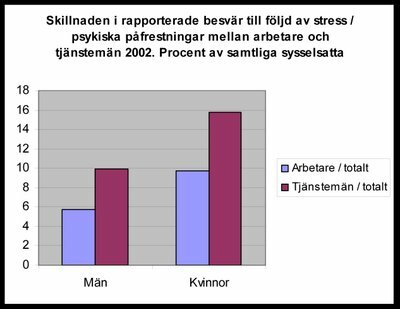 The "stoppa pressarna" report mentions a wide range of less stress among students of different programmes. From the Humanities-faculties 8 %, from the Art programmes 39 %. Only the Law students show no change in comparison with the figures in Campus 2000. "Skulle det inte vara enklare, om regeringen upplöste folket och valde ett nytt?" reflekterade Brecht. Men det som regeringar inte fåråstadkomma kan till synes populationsstudier göra. Genom ett stortbortfall kan befolkningens representativitet förvandlas till ett tacksamt,snävt, empiriskt urval. Genom att omdefiniera begrepp i studiensundersökta variabler blir egenskaperna hos populationen söktaistället för undersökta – och påträffade i konsonans med studiehypotesen. En sådan underbyggnad skulle förvandla en hypotes från illusiontill gloria, med risk att hypotesen slutligen hamnar i läget null"